Ladysolly was playing bridge this evening, so I got a long day out. It was hot and sunny, and I got through six batteries on my travels. 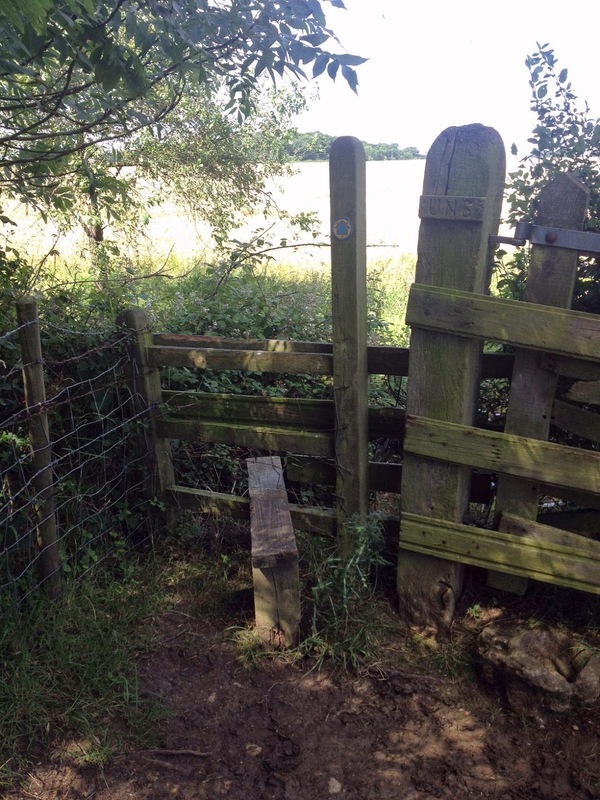 As you can see from the marking on the post, this is a bridleway. How am I supposed to get a horse over this stile? Fortunately, I wasn't on a horse, and I was able to lift my bike over. I finished that circuit (36 finds, 1 DNF) and then went on to "Wansford and back". In the middle of doing that, I diverted to do "SSC2014", which covered ground that I remember going over a while back. I also grabbed "Hawthorn view". Again, I remember doing this before, although this time, I had the added fun of having to cross the A1, a fiercely busy dual carriageway. Near the end of "Wansford and back" I diverted again to pick up some extras, including a puzzle I'd solved a long time ago. Near Sibson, I found myself on the wrong side of the river Nene, and the only possible bridge I could see was a railway bridge. But all was not lost! As well as carrying the railway, it was also a pedestrian bridge (and if you're willing to carry your bike up two flights of stairs, a bike bridge). I got back to the car at 7:30 pm, a good time to set off for home. So do I, but I wouldn't be willing to jump over a two-foot wide gap with barbed wire on both sites and a tree overhanging. Especially with a passenger on my back. Report it to the appropriate Council's Rights of Way Officer?